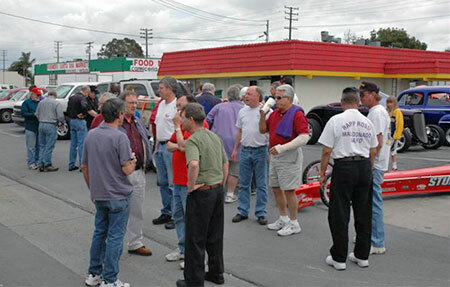 Cars have always been a big part of the landscape in Southern California and thats why so many car dealers sponsored race cars or races back in the 1960s which was, of course, the era of the muscle car. 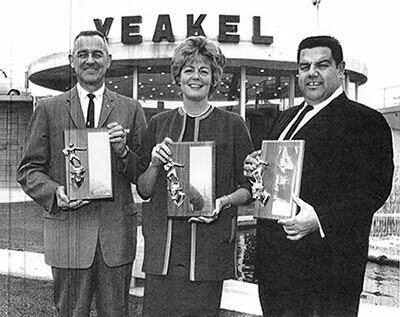 One such dealer was the Yeakel Plymouth Center, who's General Manager was the late Lou Baney, which made a living by smashing prices and sponsoring some of the great drag race cars in the area. 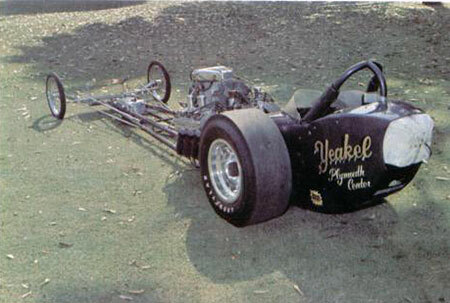 One of the most famous cars that they ever put their name on was the Yeakel Plymouth Special Top Fuel dragster that was owned by Lou Baney and driven by a young man by the name of Tom McEwen. 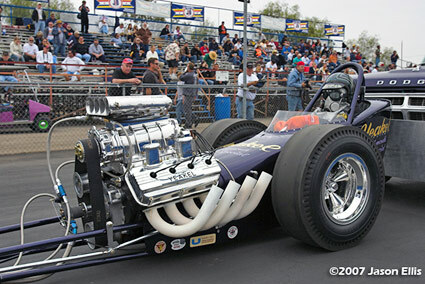 And of course Vince Rossi was the creator and the one who bled sweat day in and day out to run this car. 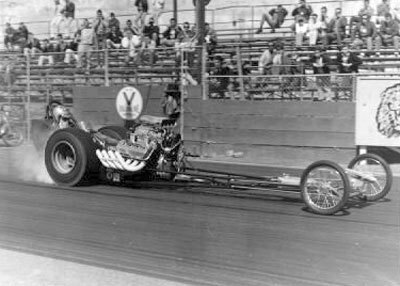 In 1965 there were only four national events on the race schedule but there were Top Fuel races at almost every track in Southern California almost every week. 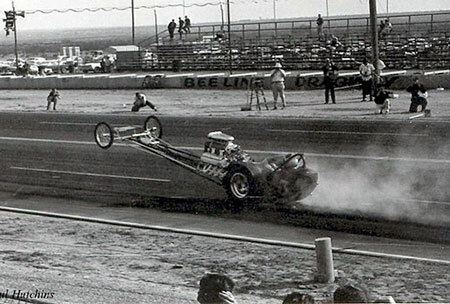 Among the biggest attractions in those days were Top Fuel match races and one of the key ingredients to any successful match was Tom The Mongoose McEwen. 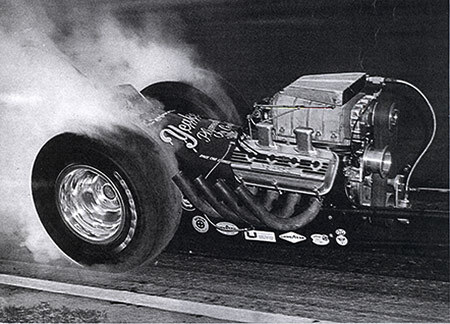 Driving Lou Baney's beautiful Yeakel Plymouth car the Goose highlighted races at Lions Drag Strip in which he faced Chris Karamesines and Don Prudhomme among others and, more often than not, he came out the winner. 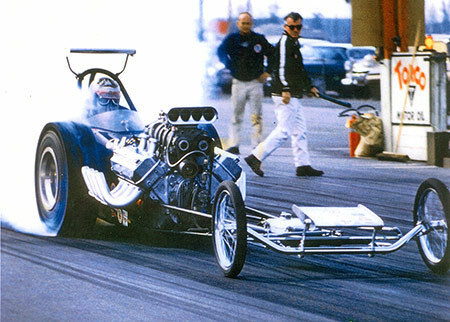 Prior to his much-hyped race with Don Prudhomme, Tom proclaimed that I am the greatest, and then he went out and proved it. 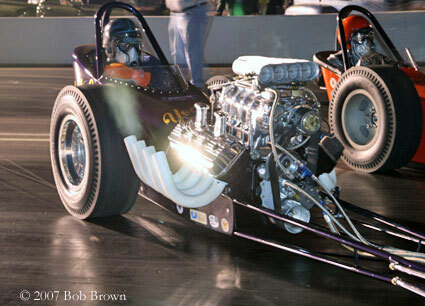 A 7.82 in round one coupled with a patented Mongoose holeshot easily beat Prudhommes much quicker 7.56. After dropping the round two encounter Tom came back to beat the Snake again in round three to take the win and again he did it on a holeshot. 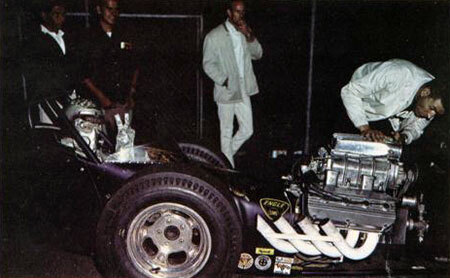 While Toms driving was a big part of the cars success even he had to admit that he was at the controls of a pretty impressive race car. 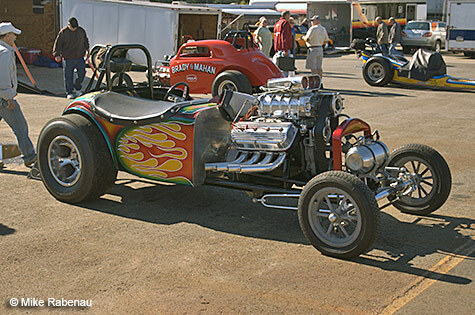 With a specially built Woody Gilmore chassis and a strong 392 Chrysler engine this car was destined for fame and fortune. 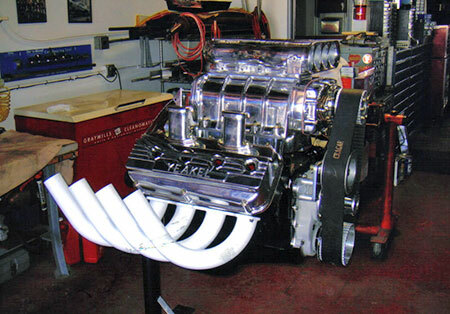 Throw in the impeccable tuning capabilities of Vince Rossi and John Garrison and its easy to see why the folks at Yeakel Plymouth decided to get on board. 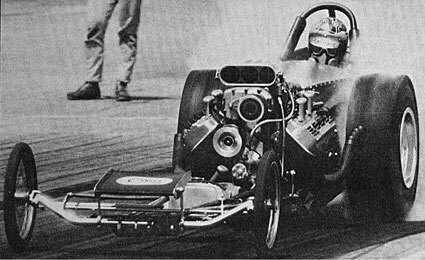 In addition to the series of match race victories Tom also took the car to several wins on the UDRA circuit and he was the top qualifier at the 1965 Hot Rod Magazine meet at Riverside Raceway. At that race, the beautiful car with the hot young driver clocked a stunning 7.52 at a speed of 211.76, good for low elapsed time and top speed at one of the biggest races of the year. 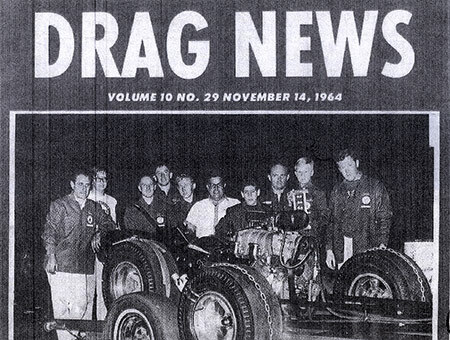 So, in 1965, while the Yeakel Plymouth Center was smashing prices, the car that they sponsored was busy smashing the competition and earning a spot for itself in the history of drag racing. 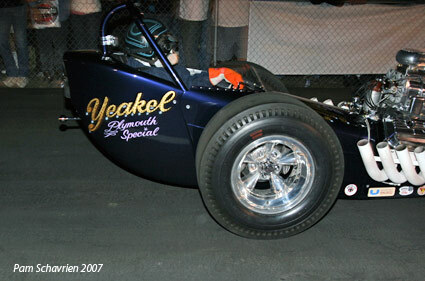 Although Jim Ward was the first driver of the Yeakel car, it was Tom McEwen who people remember being "the driver". 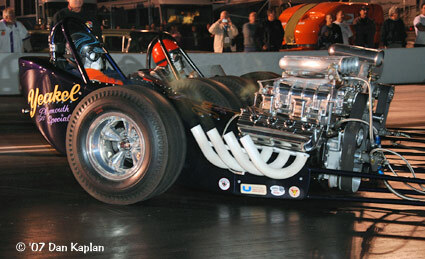 Other recognizable names involved were Don Prieto crew (worked for Baney) and John Garrison who was the engine builder. 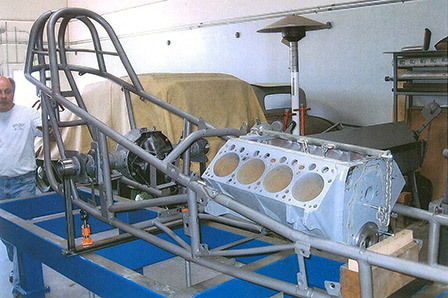 The car was built in November of 1964 by Woody Gilmore, Paul Sutherland & Pete Ogden (Race Car Engineering). 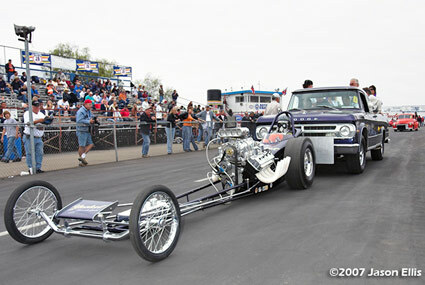 This was only the 10th car out of Woody's shop and has the first type of front axle mountings Woody used. 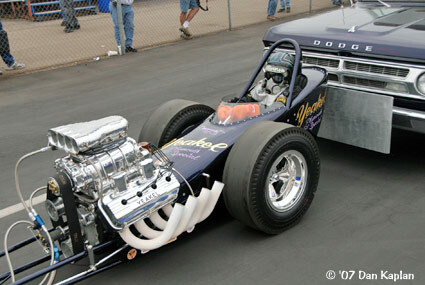 The body was the work of Doug Kruse. 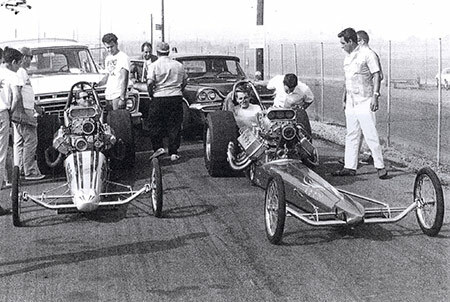 Vince Rossi, Mark Christ, Chris Young, Chuck Goebel, Wayne Long, Lou Baney, Paul Rossi, Jim Ward, Frank Baney and Tom McEwen at Fontana. 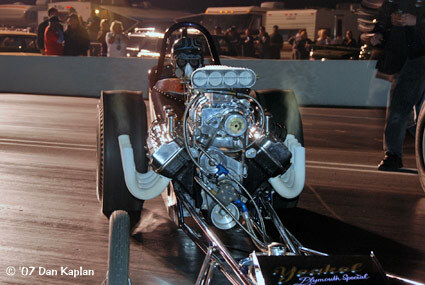 Baney pulling the spark plugs. McEwen and his patented 'V' for victory sign. 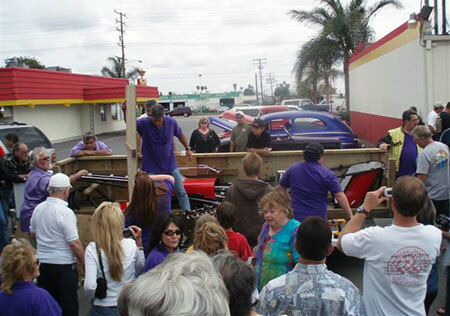 McEwen with the car in front of Yeakel Plymouth Center in Downey. 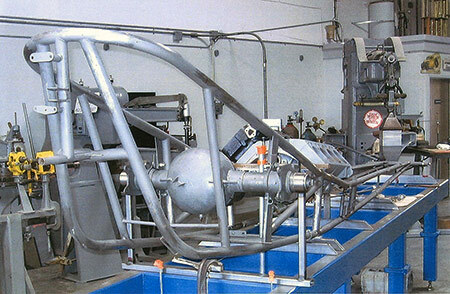 A rare shot of the car with a rear wing attached to the top of the roll bar. 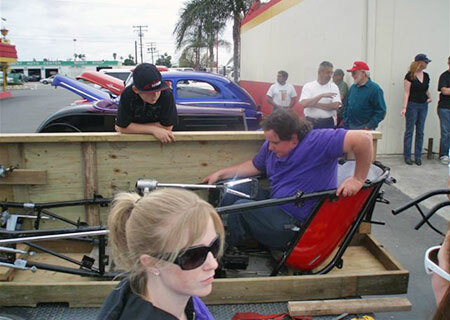 This was a good idea in theory but was short lived when the car did a giant wheelstand in the lights. 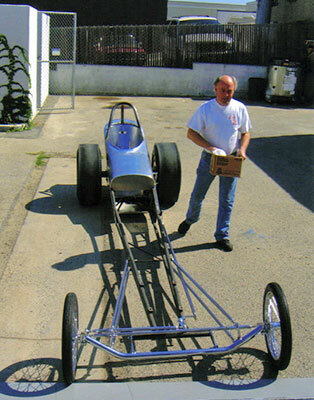 The wing later appeared on Jim Ward's (Imperial) AA/FD. 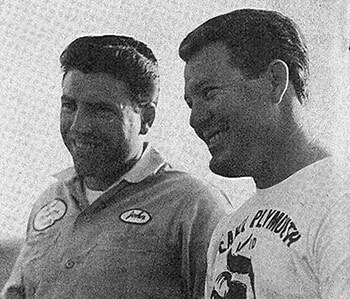 In mid 1966 Baney changed camps and teamed up with Brand Motors Ford the turn the Yeakel Plymouth car into the Brand Ford Special. 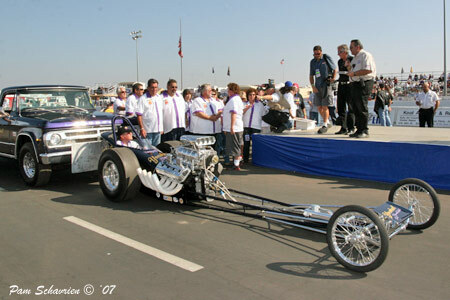 A full body was added and an Ed Pink Ford SOHC "cammer" replaced the Chrysler hemi. 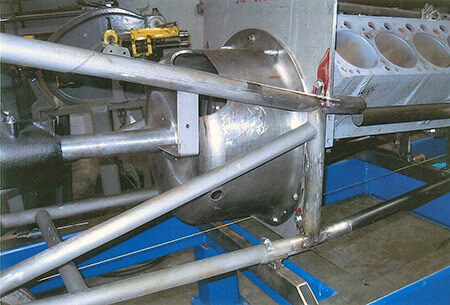 McEwen remaind in the seat until he was replaced with Kelly Brown. 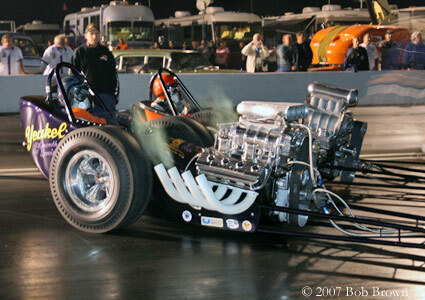 The staging lanes at Lions: Tom McEwen in the seat with Chuck Johnson standing behind the tire. Lou walking toward Vince Rossi. 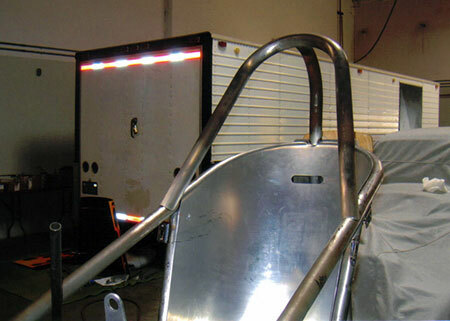 Next to them is the Rossi Rapp and Maldanado car with Gary Gabelich in the seat. 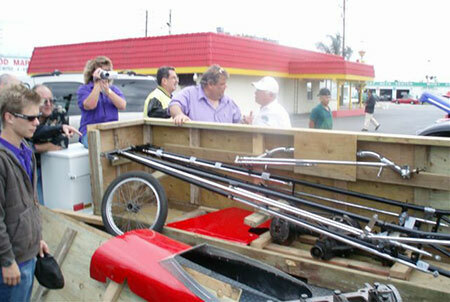 Ronnie Rapp in the wagon and Chayo Maldanado in the white pants. 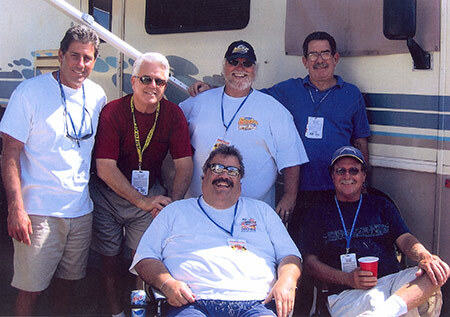 Ed Pink, Kelly Brown, Lou Baney, Frank Baney, Jerry Bivens, Kenny Miller and Chris' brother. 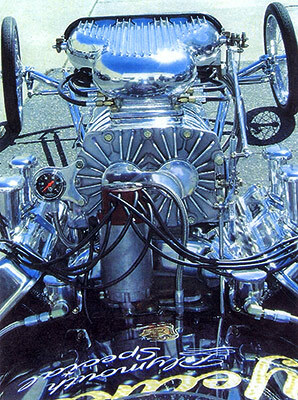 In 1967this car was sold and shipped to Hawaii. 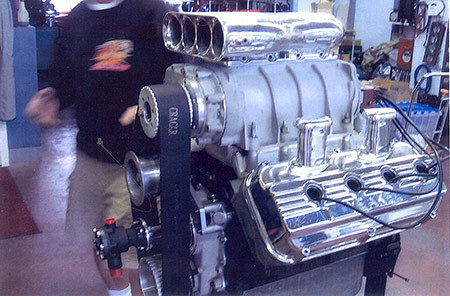 Baney built a new car with the Brand Motors colors to house his Ford SOHC engine. 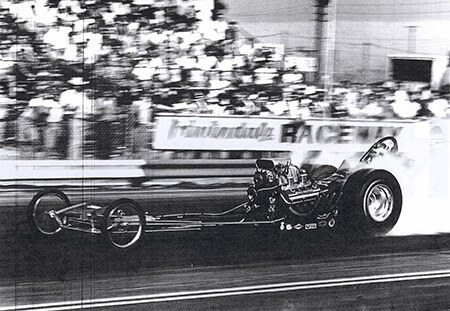 The last photo of the car, re-named "Bad Jose", in action from 1974 at Hawaii Raceway Park in Oahu. 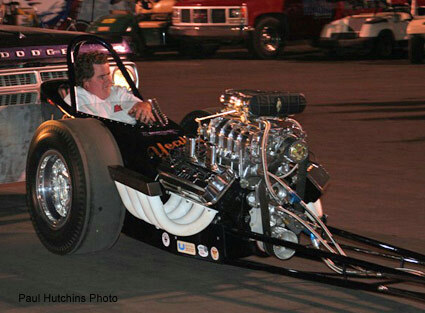 What got the project rolling was when Dugan Yeakel signed a release for his family name to be used on the car. 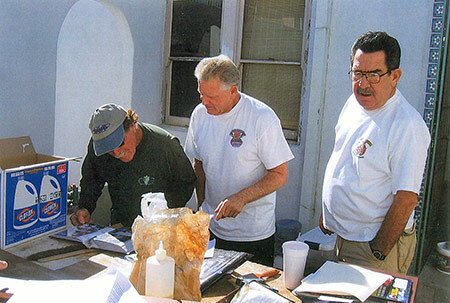 Chris Baney and Chuck Goebel were witnesses. 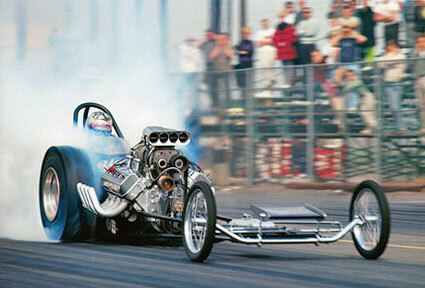 In the 1950s through the 70s, Lou Baney was the prime mover in the SoCal automotive and drag racing scene. 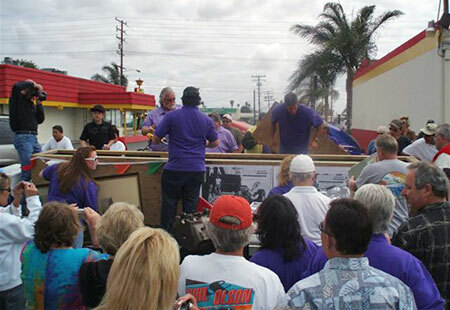 Among his many duties: GM of Yeakel Plymouth, connected to the 1950 Saugus drag strip, SoCal Plymouth Dealers Association, UDRA president, founder of SEMA, Baney Motors, Brand Ford, etc. 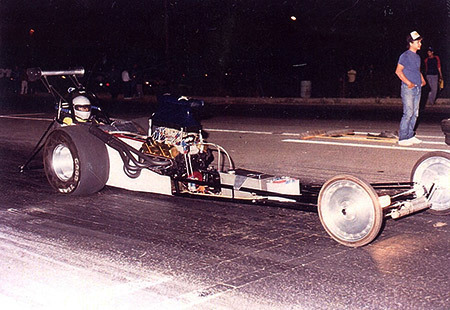 Vince Rossi (who worked for Baney) was the driving force that put together this car and a string of other intertwined dragsters together. 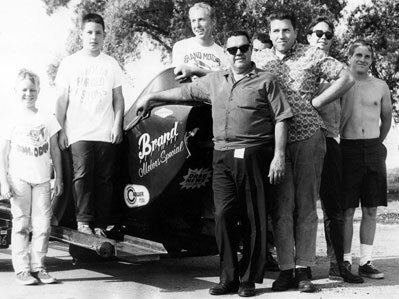 The late Lou Baney and crew (with family & friends) posing with his Brand Motors Special AA/FD. 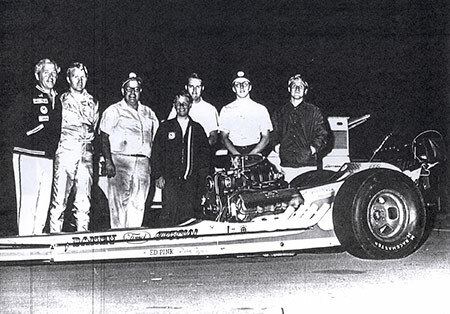 From LtoR: Frank Baney, Paul Maders, Wayne Long (Tom's chute packer from Carter Chutes), Lou Baney, Chuck Johnson, John Garrison, Mark Christ and Chris Young. 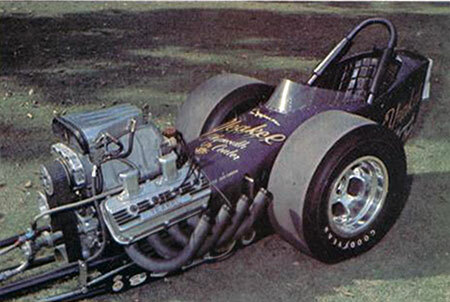 Prior to this Yeakel Plymouth dragster was a fueler known as the Baney Rapp Lisa Rossi purple Kent Fuller car with a rather round nose and awkward chute pack tail section. 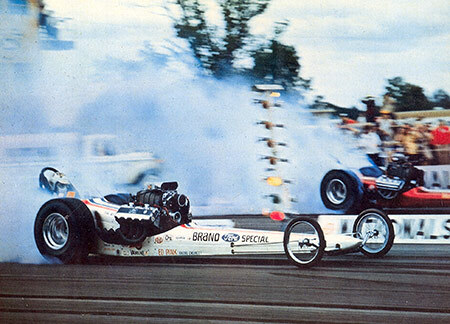 After this effort Baney turned the Yeakel Plymouth car into the SOHC Ford powered fueler known as the Brand Ford Special with both Tom McEwen, Kelly Brown and then then Don "The Snake" Prudhomme in the seat. 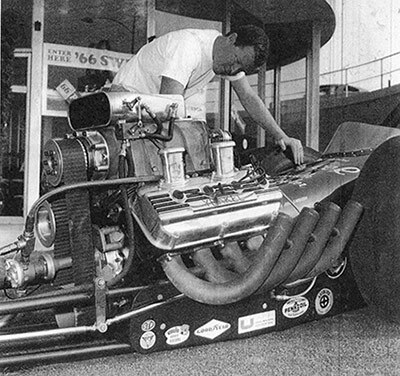 Ed Pink oversaw the engines. 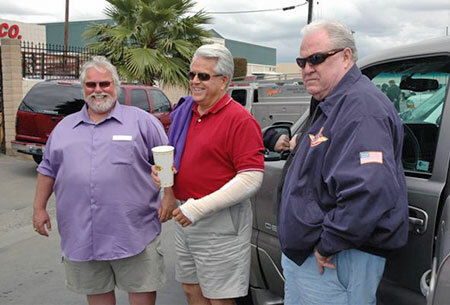 Rapp also was again in the picture with Rossi Rapp and Maldanado with Gary Gabelich and at the helm. 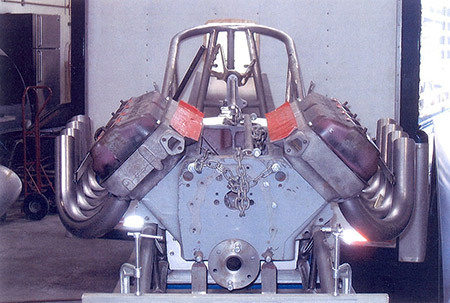 Rossi later teamed with Tommy Lisa to build the Lisa & Rossi "Door stop wedge" rear engine dragster with Billy Tidwell and eventually Danny Ongais at the helm. 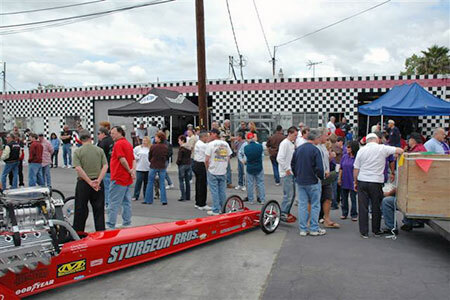 While the combinations of people changed, this was a big happy family of drag racers that raced because it was fun and it was by far the greatest time for dragster racing. Partners shared parts and race one another and guys like Donovan, Brissette, Madden Leland Kolb, the Surfers all had a great time racing. 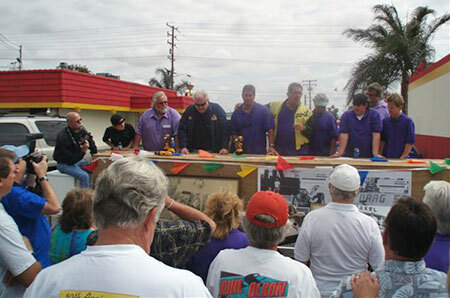 And so, in the memory of Lou, Vince and others who came before them, the Baney, Rossi and Goebel bunch set out in 2004 to find the Yeakel Plymouth car and if they did - restore it. 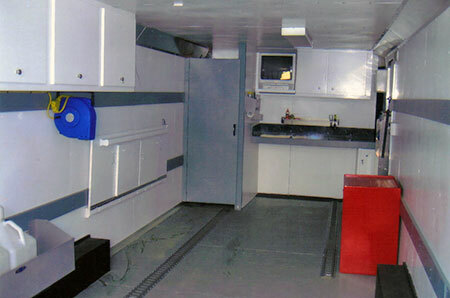 As luck would have it, in 2005 the car was found in Maui, Hawaii (below). 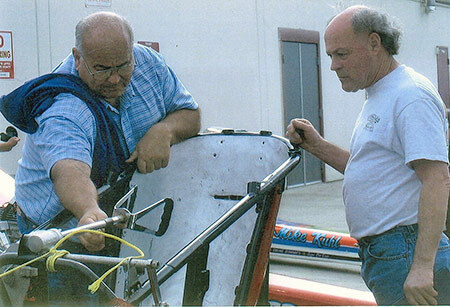 03.22.05 - Frank Baney paid for and picked up the with the help of Paul Schavrien's friend, Dwayne Jacento. 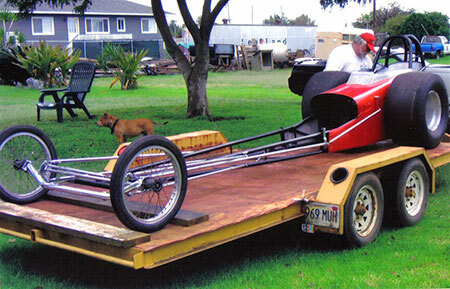 Dwayne dismantled the car, cut off the roll bar, built the crate and shipped it by sea after Baney left Maui. 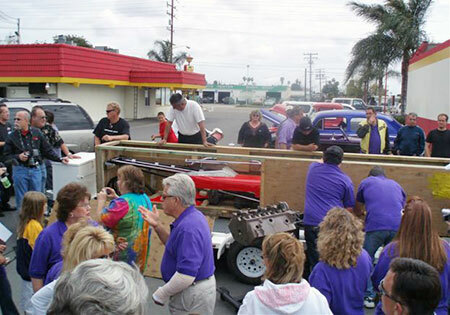 Saturday, April 22, 2005 was designated the "Grand Opening" of the crate-full of memories. 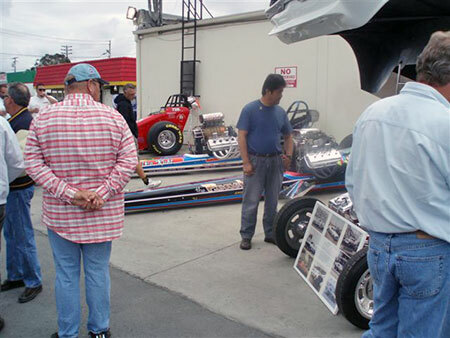 And what an event it was with nearly 100 people, cacklecars, current nostalgia dragsters, hot rods enough bench racing to fill a book. Everyone there had there own special relationship to Lou Baney, who was often at the center of converging forces and changing directions. 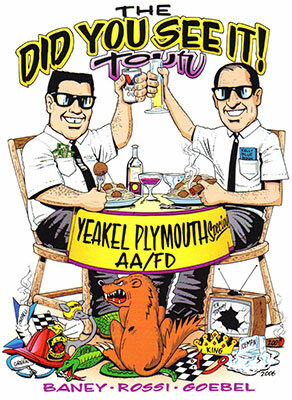 And so began the Yeakel Plymouth AA/FDs rebirth. 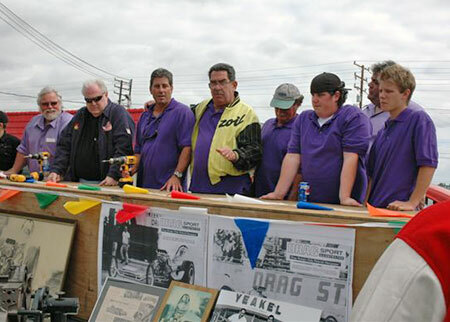 The players preparing to open the crate: L to R: Frank Baney, Tom McEwen, Paul Rossi, Chuck Goebel, Chris Young, Tyler Baney, Jimmy Rossi, and Cameron Ferre. 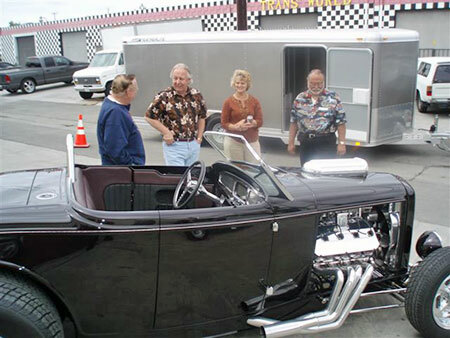 The restoration was entrusted to master craftsman Steve Davis who, along with original crewman Chuck Johnson, got their first look at the car. 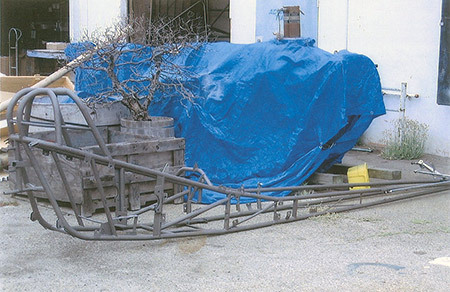 The chassis was sandblasted then dropped off at Davis' shop. 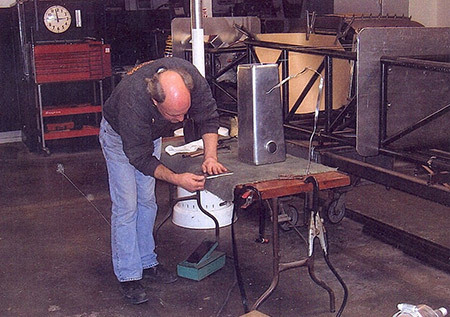 05.20.05 - On the jig. First Davis cut off all the brackets that had been added over the years. 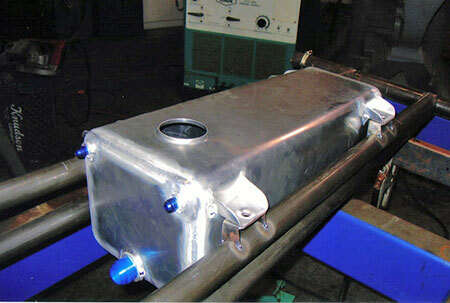 Davis fabricating the end plate for the fuel tank. 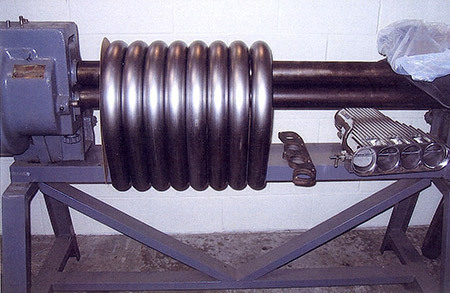 A new front axle and tubing was used with the original spindels and rod ends. 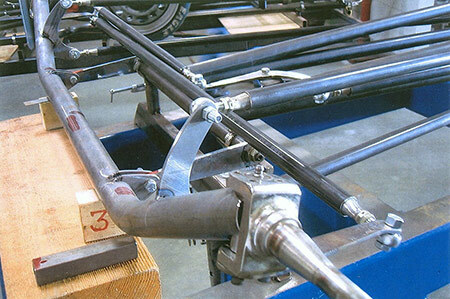 Bent header tubing (above) and finished headers below. 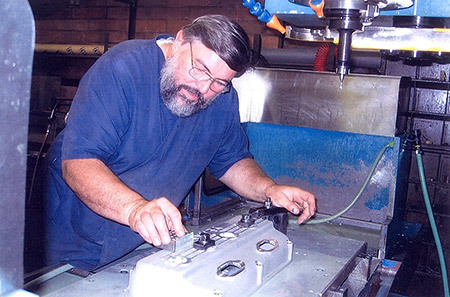 Doug Upton did the "Yeakel" engraving on the Donovan valve covers. 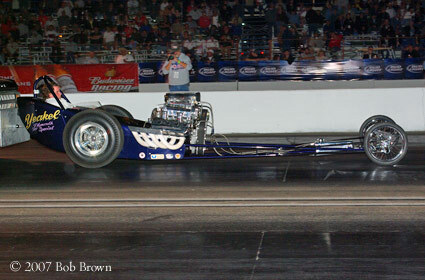 The fuel burning 329 was done by Mike Kuhl. 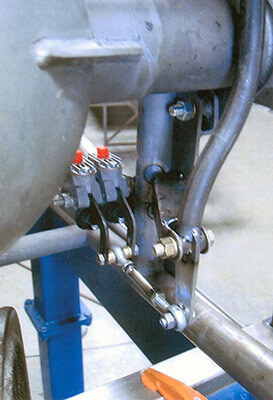 The brake calipers and handle are exactly as original. 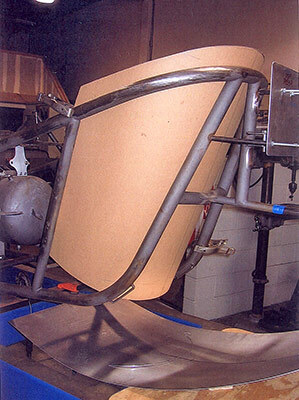 Davis started the tail piece at the top. 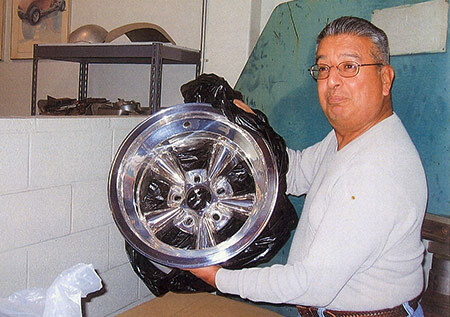 Manny Maldonado shows off the highly polised rear wheels. 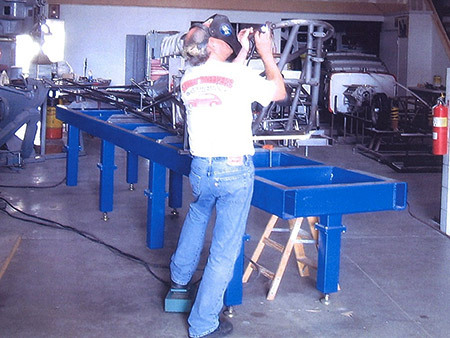 Steve Davis likes to be involved in every aspect of his restorations. 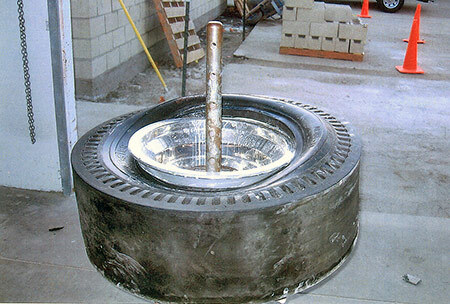 He donated a pair of period correct M&H tires and insisted on mounting them himself. 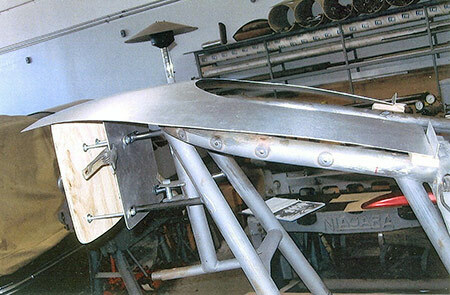 The tin for the bottom of the tail sits under the one piece seat pattern. 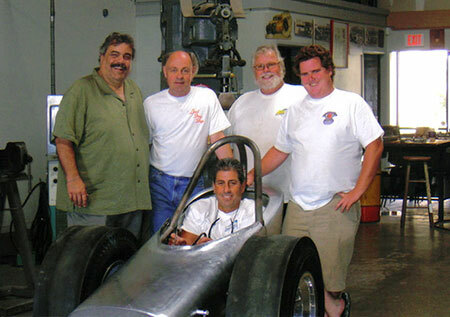 Jim Rossi, Steve Davis, Frank Baney, Tyler Baney and Paul Rossi (in the car). 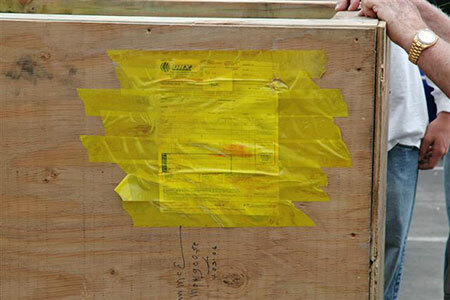 Engine waiting for its new home. 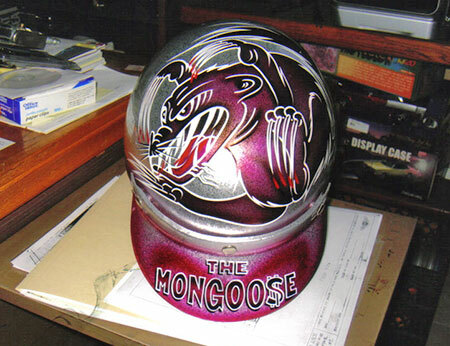 The 1965 Mongoose helmet was perfectly recreated. Period correct push truck for a not so period correct trailer. How sweet would it have been to tow that sucker around in 1965. 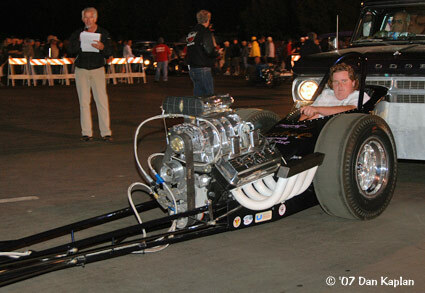 With Paul Rossi in the seat, the car made its official Cacklefest debut as a featured car at the Double Tree Hotel in October of 2007. 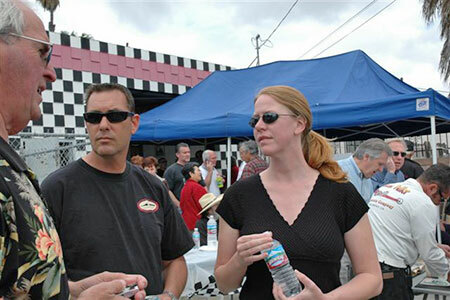 Following the Friday night CHRR Honorees Awards inside, there was a mini-cacklefest outside. The purple car performed flawlessly. 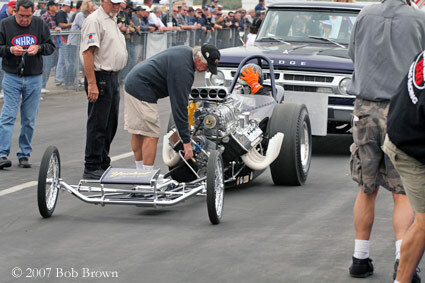 At the track on Saturday, Jerry Bivens had to do the obligatory practice push start prior to Cacklefest. 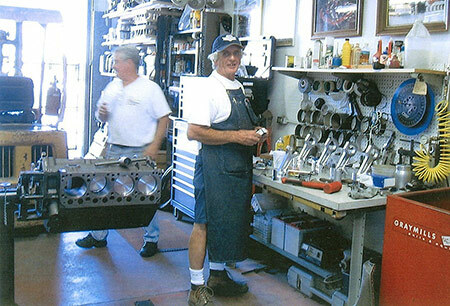 Above, Mike Kuhl made the final checks of the engine. 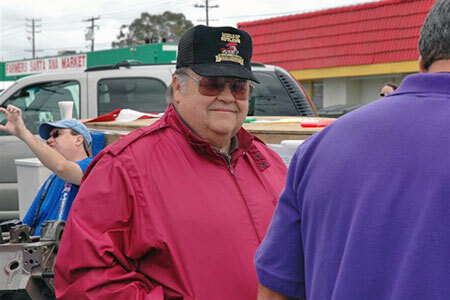 In the seat for the Cacklefest Parade was Frank Baney's son, Tyler. 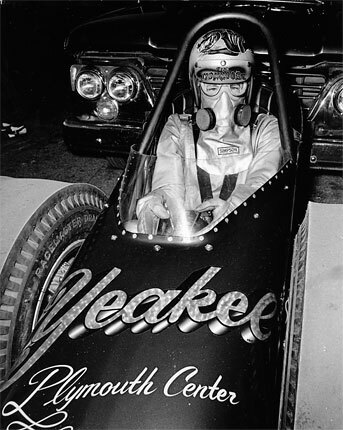 In the seat for the Yeakel Plymouth Special debut was Jerry Bivens who is Lou Baney's son-in-law and ex-top fuel driver. 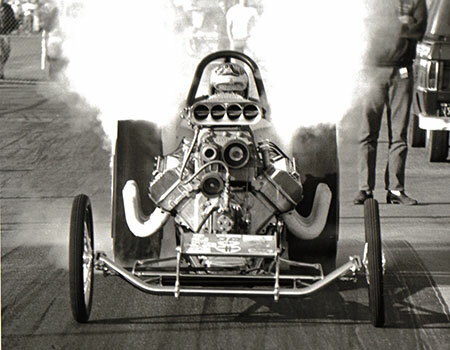 The push start was no problem for the old pro. 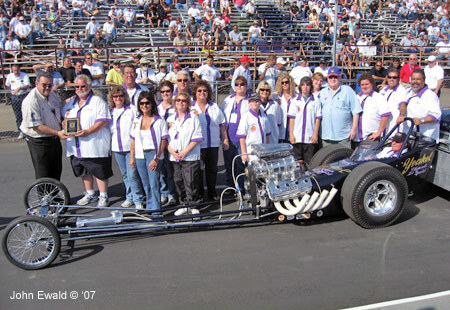 The icing on the cake for a perfect weekend was the Rossi & Baney clan, Chuck Gobel, Tom McEwen and friends winning the "Cacklefest 2007 Outstanding Presentation" award. 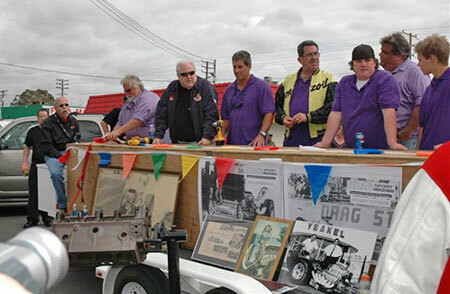 Paul Rossi (owner), Jerry Bivens (Lou's son-in-law), Frank Baney (owner), Chuck Goebel (engine), Jimmy Rossi and Chris Young.